Mootapalam is a wild growing fruit of Western Ghats of India. 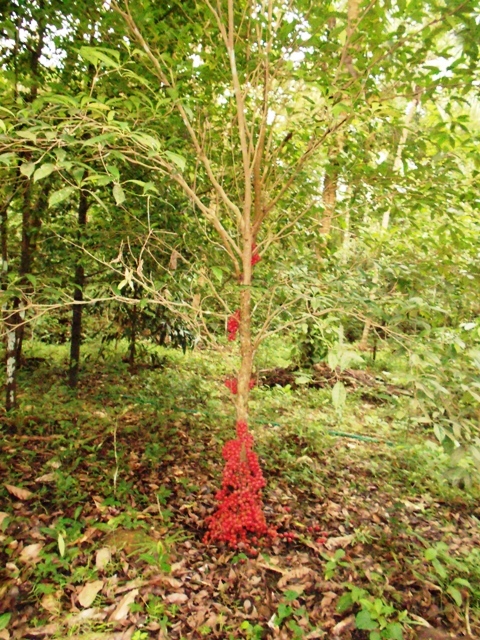 It grows as an understory plant in moist evergreen forests of from North Kannada to South Kerala and the adjoining western parts of Tamil Nadu upto an altitude of 900 m. It bears edible fruits. Trees upto 10 m tall; bark grey usually smooth or scaly; blaze light orange; branchl4ets terete, glabrous. Leaves simple, alternate, clustered at twig ends; stipules ovate, acute, hairy, caducous; petiole 1.2-3.8 cm long, swollen at both ends, terete, puberulous when young; lamina 7.5-17.8 x 3-7.6 cm, oblanceolate, apex bluntly caudate-acuminate, base cuneate, chartaceous, glabrous, midrib slightly raised above; secondary_nerves 4-8, ascending ; tertiary_nervesslender, distantly percurrent. 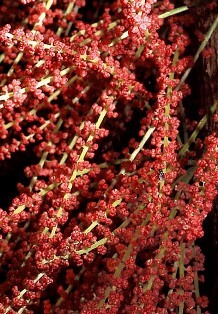 Inflorescence cauliflory; flowers unisexual, dioecious; male inflorescence in clustered racemes on short tubercles all over the trunk, red; female inflorescence in clustered racemes, mostly confined to base of the trunk. 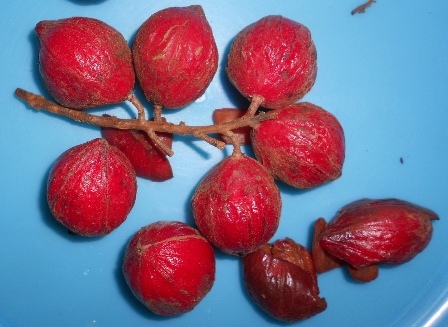 Fruit a capsule, crimson, globose, beaked, 1.5-2.5 cm across, ribbed, pubescent when young; seeds broad compressed with fleshy aril. Though the fruits are sour but still edible and eaten by local people. These are also used for pickling. 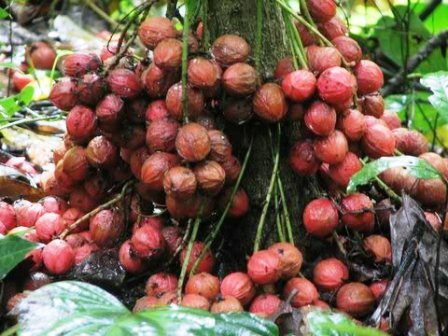 Mootapalam fruits are collected from the wild only. These are not cultivate.